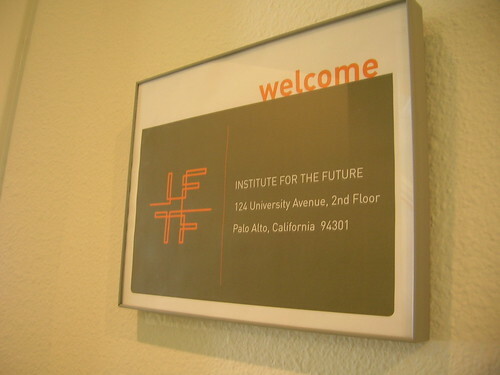 I had lunch today with my friend Alex Pang at the Institute For the Future in Palo Alto. The discussion was around the Internet of Things, spimes and blogjects. Starting by discussing Bruce Sterling's Shaping Things, we were thinking about the fact that as Sterling says there is no smartness in the objects; the smartness better resides in the was those objects and networks help us to make better choices; especially with regards to specific actions or meeting people. Wired and connected objects may indeed help choosing what tools can be used to consume less energy, sharing certain types of objects with others that would be trackable is also of interest (and is actually a topic discusses in one of the story Bruce Sterling wrote in "Visionary in Residence"): a kind of community hammer or driller for instance. Alex and I also discussed some potential ideas about the blogjects serie of workshop I am organizing along with Julian. Additionaly, Jason tester updated me on their pervasive gaming projects that is a very relevant synthesis about context-aware games. This project interestingly started first by looking at the history of video games from the POV of users and then continued as an overview of the pergames directions. Alex finally encouraged me to go deeper in the Science Technology and Society world, which is quite a good idea.